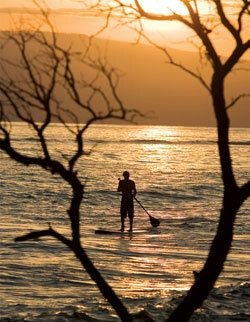 Stand Up Paddle Surfing is an ancient form of surfing. It can be traced back to the very early days of Polynesia. It's most recent history dates back to the 1940's when the beach boys (surf instructors) on Waikiki beach used to stand up and paddle out to the break using a one bladed paddle. The reasons for this are 2 fold. First it allowed them to have a better visibility over their group of surfing instructors and allowed them to call the sets easier as their upright position meant that they could see the swell long before the prone surfers. Secondly it allowed them to keep their wealthy customers camera dry and allow them to take pictures of them surfing. As time moved on board designs and fashions changed, the paddle was all but lost in the history of surfing. A few surfers in Waikiki continued to use a paddle but they were very much in the minority. Fast forward to the first part of this century and the paddle made a return to surfing in the hands of some of the world's most famous watermen. They were discovering stand up paddle surfing to allow them to keep in shape for the bigger days of tow surfing as well as adding a new dimension to their skills. Standing up and paddling out through the waves is a totally new experience. The level of surfing on stand up paddle boards has sky rocketed in the last few years with feats such as Archie Kalepa's crossing between Molokai and Oahu and Laird Hamilton's recent foray out at Jaws on a stand up paddle board. 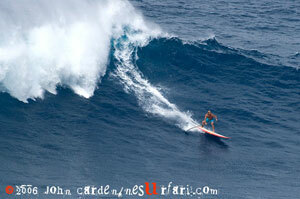 Many riders are pushing the sport to a new high… All around the world SUP are taking over the most famous surf breaks. Modern technologies have allowed the boards to come down a lot in weight and modern understanding of board design has allowed the large boards to be maneuvered easily on the waves. Carbon paddles cut weight and increase board speed and suddenly Stand Up Paddle Surfing has been reborn. It isn't going to revolutionize or take over the world, but it does add another angle to surf riding.